FREEPORT — Ilysa Cantu grinned nervously as she stood at the front of the library, waiting to show her classmates what she had made. “Voila!” the Lanier Middle School fifth-grader exclaimed, enthusiastically pointing to the fluffy white dog set against a backdrop of flowers she created using computer code. Ilysa’s creation drew gasps of awe from her classmates. She paused several times on the way back to her seat, pointing out to classmates the steps she had taken to change her background. “I was just messing around trying to find new things and I found it,” Ilysa said, beaming with pride. Ilysa and her classmates joined more than 100 million students worldwide Tuesday for the Hour of Code campaign, an international movement that aims to provide students a foundation in computer science and computer programming. “We’re trying to get the kids interested in computer science. It’s an international push to get the kids interested in it,” said Nancy Gardner, Brazosport ISD’s director of media and digital learning. Digital Learning coach Kevin Gibbons showed students examples of the short videos they could create, taking them through the various settings — a pet store, a bustling city and the surface of the moon among the possibilities. Gibbons stopped periodically to point out the special effects, such as writing dialogue for the characters and changing the animals they encountered — all of it entirely at their discretion. That creative freedom and interactive element is something that has developed with technology, Gardner said, piquing the students’ interests even more. 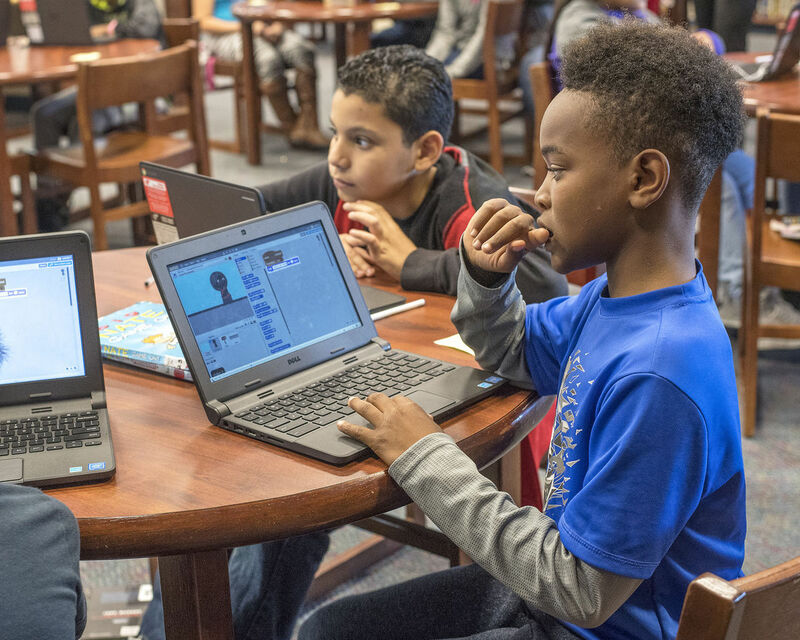 Although Brazosport ISD students have participated in the Hour of Code for several years, this was the first time to bring the event to Lanier Middle School, Principal Richard Yoes said. Liz Fambrough smiled as she surveyed the students quietly working, all of them engrossed in perfecting their codes. The Lanier Middle School librarian often sees the seeds planted by events like the Hour of Code in the minds of students who join her after-school computer science club.